The Notables: Weds. & Thurs. 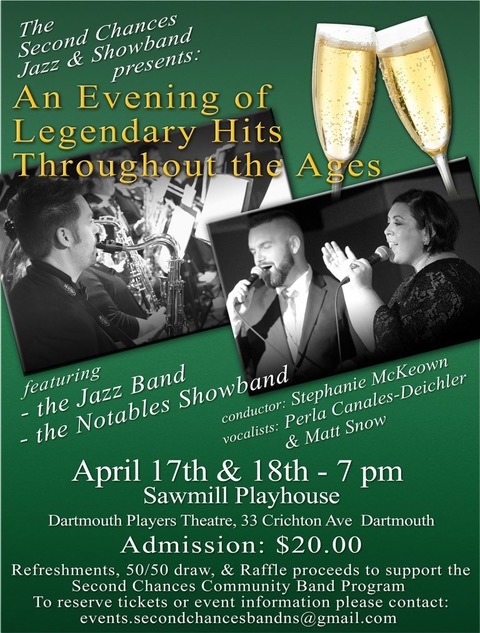 The Second Chances Show Band, “The Notables”, is a program offering of the Second Chances Community Band Society of Nova Scotia, a non-profit society established to provide musical education and performance experience for adults who wish to return to playing or learn to play as a beginner. The society programs consist of a Concert Band, Beginner Band, Percussion Ensemble, Jazz Band and the Show Band. The Show Band, under the direction of Stephanie McKeown, was established in January 2017, with a focus on performance activities, including the accompaniment of vocalists; its repertoire features music in the Jazz, Jazz-funk, Standard and Popular genres. The 18 piece Band is configured in traditional “Big Band” format of Brass, Saxophones and Rhythm sections. Since its inception, The Notables have performed successful concerts with the Enchor East and in the Summer Sounds on Barrington series as well as participating in Second Chances Community Band concerts. The Show Band presents music with broad appeal, has a ton of fun playing and leaves their audiences smiling.